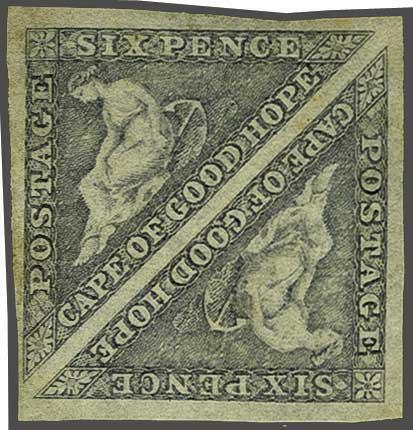 1855/63: 6 d. slate-lilac on bluish paper, an unused pair, with ample to large margins all round and of excellent if slightly faded colour, fine but for small trace of staining on shortest side margin, without gum. A very rare multiple. Cert. RPSL 30,247 (missing) Gi = £ 9'000+.rnrnProvenance: Collection D. Alan Stevenson, Harmers, Nov 1950, lot 130.rn Collection 'Salisbury', RL, Sept 1995, lot 1014.rn Collection Mrs. Ad Indhusophon, Spink, May 1999, lot 82.